Showing results for tags 'sowon'. Post your favorite picture of most beautiful Sowon Mine is this one, no this one,wait lets go with this one, I'll probably spam this topic a lot since I love every picture of Sowon. 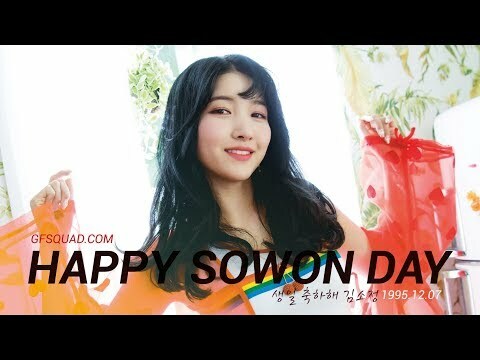 Group GFRIEND’s Sowon made remarks about her body. [10asia Woobin Reporter] Source: https://entertain.naver.com/read?oid=312&aid=0000359603 On MBC Every1’s variety show ‘I Have Something To Say Today’ which will air on December 1, Nicole and Sowon revealed their completely different body care secrets. Nicole pointed out to GFRIEND’s Sowon that she had something to say. Nicole, who came to this popular dessert cafe with Sowon said: “It’s the first time I’ve had this much sweet food in front of my eyes. I’ve never done anything without dieting.” She talked about when she was in Kara and had to manage her body intensely. “My company told me to gain weight”, said Sowon, “I’ve never been on a diet.” Which caused the cast to be completely shocked. MC Kim Jimin said “I’ve never met Sowon before but she sure is cheeky” causing everyone to laugh in response. Sowon and Nicole, an unexpected friendship, said: “We spent our days as trainees at the same agency and knew each other before debut.” In addition, Nicole surprised her by revealing that she went and enjoyed GFRIEND’s concert herself. On the other hand, Nicole revealed that she prepared hot places around Seoul from theme parks, to a hot club in Itaewon for Sowon to relieve her busy schedule. ‘I Have Something To Say’ is broadcasted every Saturday at 7:50PM.